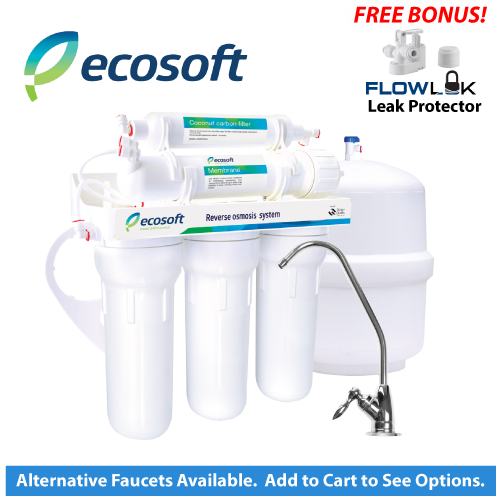 The Ecosoft five stage reverse osmosis water filter system offers premium quality drinking water at a fraction of the cost of bottled water and without the hassle of re-filling bottles. All Ecosoft drinking water systems use standard cartridge and membrane sizes, and include installation hardware, spanner wrench, and long-reach all-metal faucet with chrome finish. 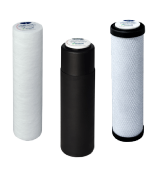 - Traps silt/dust, rust and sand which may affect the taste and look of your water, while at the same time protecting the other filters from premature fouling. 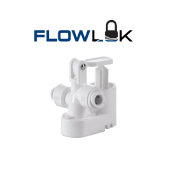 - Reduces chlorine, organochlorine compounds, chlorination disinfection byproducts (THMs and HAs), many VOCs and more. 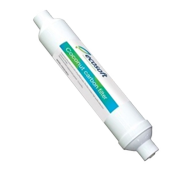 - Improves the taste and smell of your water and further reduces chlorine, organochlorine compounds, chlorination disinfection byproducts (THMs and HAs), many VOCs and more. - Removes 99.8% of mineral and inorganic impurities. - Improves the taste and smell of your water by removing a wide range or organic compounds. Self-Cleaning: This system uses a process of crossflow to constantly clean the membrane to prevent pre-mature fouling and clogging. Ecosoft warrants to the original owner (under normal use) to be free from defects in material and/or workmanship for one (1) year from the date of purchase.